Back in March, I shared this tutorial on some glass bowls that I hand painted with multi-color dots. These bowls now sit on a red table from Target which makes me love them even more; I am very glad that I decided to use red in the original color scheme. 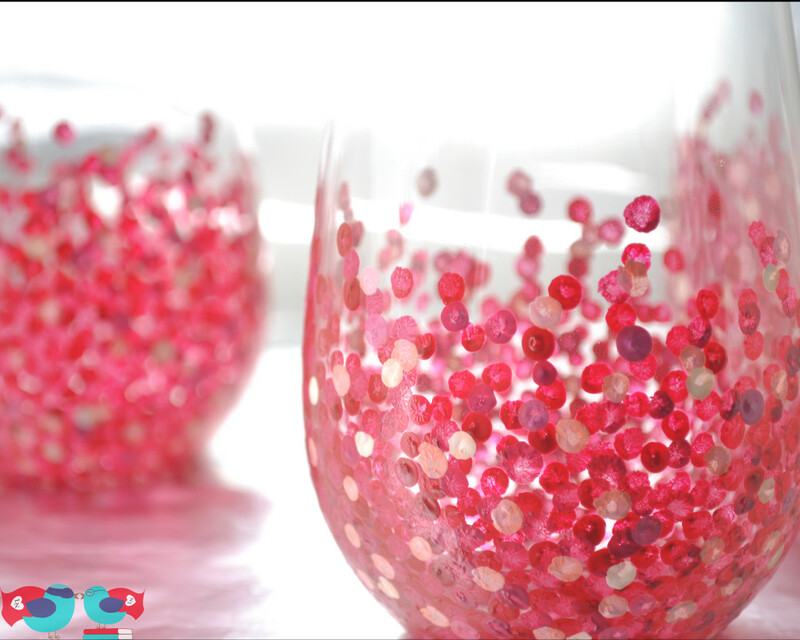 I used the same process to make these stemless wine glasses for my mother-in-law’s birthday. Her absolute favorite color is red, so I used FolkArt enamel paint in Engine Red and Magenta with a little bit of Baby Pink and White. I am excited to use this process in the future with other color schemes and see how the look changes. As I suggested with the glass bowls, I would recommend hand washing only. Also, make sure not to put the paint too far up on the glass. I left a little over an inch clearance. When a person drinks from it, there mouth should NOT be touching any of the paint. 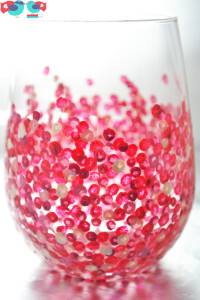 These glasses are just gorgeous and love the color! Thank you SO much for sharing and joining us at Best of the Weekend. Hope you can party with us this Friday – pinning to our party board! Have a wonderful rest of the week! Soooo pretty! I love the color! I have already been following you on Facebook but I just added you to my Bloglovin as well. I featured you today here: http://www.settingforfour.com/2013/07/10-make-create-and-decorate-summer.html Thanks for sharing your creativity at Project Inspired! Hope to see you at the linky party tonight at 8 pm EST! Very chic and smart! Thanks for sharing the tutorial. Hope you will stop by and say hello at http://www.mypersonalaccent.com/the-peacock-strut-1/ as we launch our first Blog Strut, Peacock Style. Thanks, Sande! I will definitely check it out. Thank you so much for featuring, Carolyn! I love your blog, so this is always exciting! I would love to see your nominations! Thank you so much, Lacy! I have checked out your awesome site and am now following you on Twitter too.